When it goes to ending tracks that give a sense of finality and desolation, “Farewell” from Super Turrican II (1994), arranged on Chris Huelsbeck’s Sound Factory: Digital Audio Collection I (1995) has got to be one of the most complete, and it’s a much stronger rendition than the original SNES version. There’s a perfect combination of deep drum beats accented by a synth string orchestra and rock guitar. The main melody, played on a synth line, has long notes that tug at the sadness in the heart, waving goodbye to a constant companion before dissolving into the dark. Particular car was taken with the piano. The Sound Factory arrangement leaves a much stronger impression, with a mournful wail from synth line, a sad-sweet fluttering from the melancholic piano, and sinking guitar. There is an amazing piano solo in the middle of the track supported by emotional rises from the strings. The drumbeat is more strongly defined with a soothing rhythm that inspires a hollowness in the soul that is filled with the melody that strains for a joyful resolution but simply cannot reach far enough. The album is available off Amazon and iTunes. “Farewell” was the ending from the final game in the Turrican series. The Turrican soldier stands outside the scarred starship that took him through the black hole to fight the the army of the Machine and thinks back to all the battles he fought and realizes that there are no more after this. It seems almost as if Mr. Huelsbeck had a premonition that we would not see any more Turrican games… (or for the 14+ years since the last installment, it might as well be ‘farewell’, but I sure hope we see him again!). Read the rest of this entry ? First up is Mega Turrican. Mr. Huelsbeck’s first (of only two) compositions on the Genesis, we can tell straight away that he has done some unique things with the FM sound chip. Mr. Huelsbeck’s familiarity with computer hardware and programming from his days on the Commodore 64 and Amiga made it very easy for him to create a high-quality soundtrack that goes beyond the fare of most titles of the time (matched only by Castlevania Bloodlines, as far as I am concerned). Pay special attention to the guitar, synth, and drums (particularly at 0:38), which produce a beat that sounds almost mechanical. The piece contains original notes that would find their way to the Turrican 3 “Main Title” on the Amiga, but the majority of the piece is actually more an arrange of the Turrican 2 intro, perhaps suggesting a short development time. Two great sequences are in the beginning at 0:16 where Mr. Huelsbeck smashes down on the bass for disaster following the short, peaceful interlude, and again the guitar at 1:14 where Bren McGuire dashes off to battle. This piece actually draws more from the SFX than the actual music, and the piece really does go better with the video, which is awesome-cheesy, full of nice anime-style artwork, melodrama, and Turrican-smashing-mutants action. At the same time he was working on Turrican 3, Mr. Huelsbeck was arranging music from the entire series in the Turrican Soundtrack. 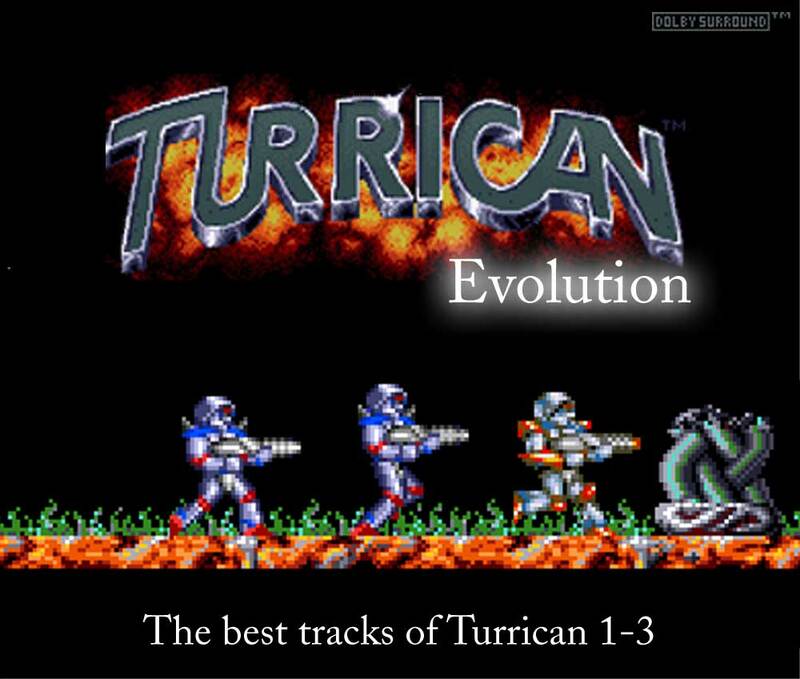 One of the best albums of game music on the market, the Turrican Soundtrack featured mostly arranges from Turrican 3 – suggesting perhaps that the composition of the game on the Amiga was partially informed by the mixing process. In any event, the version of the “Main Title” found here is more polished and fully-realized with a cinematic narrative approach, making it an audio story moreso than in the original that I think ultimately makes it a better composition. The guitar here is also more strongly pronounced, and the drumbeat more fully realized with the synthesizer. Unfortunately, the “Main Title” from the album ends up lacking the nice call-and-response from the piano and strings in the original (see below). If Mega Turrican was Chris Huelsbeck’s first composition for the Genesis, Turrican 3 was one his final scores for the Amiga (his final compositions were for Caribbean Disasterand Hatrick), and this shows through the skillful composition and sound quality, which is in many ways the culmination of his work on the platform. The soundtrack is actually a more fully-realized version of the original theme. The Turrican 3 “Title Theme” is dominated by a bright, free piano juxtaposed with dramatic, fleeting flourishes from the strings – a juxtaposition of the darkness of space with twinkling stars and heroes in cyber-armor. That dialogue between piano and strings is at the core of the song, and is spread about several times in the piece. There’s also nice use from the guitar which serves as the ticking clock (time is running out!) but also – if we compare it to the Turrican 1 theme – can serve as the rapid fire of laser bullets. The piano takes particular center stage at the half-way mark, where its hip jazz mixes with dancing strings and the bassy twang of the guitar. There’s even a nice shout-out to the Turrican II title (and these references Chris Huelsbeck is known for). It’s Mr. Huelsbeck’s style at the fullest, with elements of dance and sci-fi films. Sadly, the piece is far longer than the title video, which you would have to watch several times to witness in its entirety. Turrican is somewhat unique for me in I didn’t play the game until long after listening to the soundtrack. When I first heard the music in 1999, it was difficult to get a copy of the games – it was much easier to get the soundtrack! 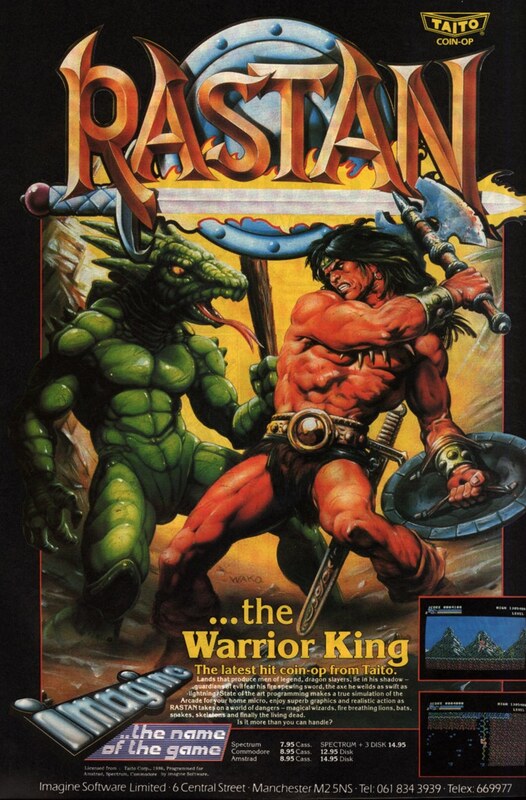 In fact, I didn’t get a chance to play the game until I found the (rather mediocre) Genesis port. 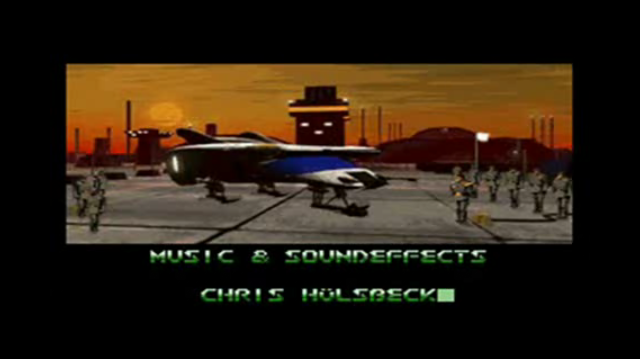 So when I first heard Chris Huelsbeck’s music, I thought “Wow, this is really cool! I wonder what’s happening…” Due to the long, variated nature of the music, as well as images I had found, it was easy to use my imagination to conjure images of space marines and alien battles. One of my favorite pieces from the series is the Turrican “Title Theme” is a heavy metal mix arranged by Charles-Henri Avelange (formerly of KMA Production), a French film and TV composer living in Seattle. “Turrican Intro Heavy Metal Remix” is absolutely breathtaking, a real tribute to the soul of the original. It opens with a thunderstorm and the disturbing, grating voice that welcomes us to the hell that isTurrican (“Another day, another try, but just remember: shoot or die!”). Guitar riffs rise from the storm, a low rumble across the battlefield that occasionally break out in roars and squeals. Ever-present is the piano, desperately ticking away, letting us know to hurry, that time is of the essence. The guitars here also seem to be made of light, piercing the dark storm like laser blasts and electric sparks (I can only imagine how this would look when performed on stage with a light show). Avelange gives his own touch to the instruments, putting soul into each note, such as the riffs at 2:38 and the standout guitars for the final ascent of the nightmare tower at 3:36. I can’t help but feel this is how the piece would sound if it had been composed using a heavy-duty. Right now, this is the absolute best Turrican title arrange I have heard. Another of my favorite renditions is the “Turrican 3D Theme” by Baran Yasar (Fearlord) of the Turkish rock band RevelatioN. It is a straight-up metal mix, missing the piano that dominated the original (and Avelange’s piece). Yasar opens the theme with an explosion of guitar, those key opening notes a perfect harmony. Next, drums are added (the drumkit leaves a little to be desired) with the guitar left as a background chugging growl that will reside through the rest of the piece and rise above for the main melody. The melody is added 30 seconds in, a heroic leap out of the smoke and flames. This is the first main segment of the melody (A), which appears again at 1:07, 3:00, and 3:56 and is the most memorable section of the melody, based on a core of three notes. Next, we are introduced to the second section (B), which rolls along with little range save a rising leap at the end. It stands in contrast to A, providing a ground level to drop back into. Next we have a return to A (1:07) with a new downward-running section at 1:18. This is followed by more new material at 1:29, where the piece gains synth-string highlights, a dynamic that takes us through some of the platforming Turrican contains. The guitar then rises in intensity (1:55), driving its way upward and forward to a string solo at 2:17. At 2:38, the guitar and drums pick up intensity, shredding back down to the main melody (AB). In the final segment, piano is added for a mysterious step-like rise – probably referring to the giant tower in the distance, at the top of which the source of all nightmares resides… The main melody reprises at the end for a heroic ending. This is overall a very dramatic, action-packed piece, and it’s great to hear it fully realized with guitars. All these mixes and more can be found on Turrican SETA’s soundbase (they’ve also got Turrican Evolution, a collection of the original Amiga music). Turrican SETA is the leading fansite for information on the series. You can also check out a synth mix as part of a HUGE medley done by Mr. Huelsbeck himself on the Turrican Original Soundtrack, which is available from iTunes. Turrican forever! Today (March 2) is Chris Hülsbeck’s birthday. He is now 42 years old. I hope he can compose music for at least another 42 years. This is because he is one of the great game music composers of our time. Hülsbeck’s career began in 1986 when his composition “Shades” won first place in the German 64’er Magazine. This was during the roaring beginnings of game music, after Monty on the Run and Super Mario Bros. had been composed and Metroid and Zelda were making their debut. While Mr. Hülsbeck has created dozens of amazing soundtracks, including his latest, Symphonic Shades (2008; a five-star album if there ever was one), the soundtrack that sticks in my mind is the Turrican series. While the Title Theme to Turrican II: The Final Fight (1991) appears in remixed format within the Turrican Original Video Game Soundtrack (1993) inside a medley of other Turrican 1 and 2 music, as well as an amazingly masterful version on In the Mix (2000), the original Amiga MOD version still sounds really cool almost 20 years after its composition. Doesn’t this title screen just make you want to go out and buy the game? (too bad it is out of print!) You can get the Turrican II soundtrack (as part of Turrican Evolution) along with a lot of other goodies from the Turrican SETA. The Turrican II “Title Theme” has an amazing beginning – I’ve included here a video to show the piece in context. From the opening notes to the finish, you know you are in for an amazing treat as the Turrican soldier emerges from outer space, leaving fire and destruction behind him. The main theme (beginning at 0:30) has the strong, bold notes we’ve come to associate with hero and action music, inspiring while simultaneously giving to the player the powers of confidence associated with the music: you are not simply watching the hero, you are the hero. And if that weren’t enough, the driving beat of the snare recalls not only gunfire (done exceptionally well in the title theme to the original Turrican), but also builds intensity and tension, urging the player to hop in already and play this game. As the main theme develops, every instrument seems to get a solo from the drums (2:16) to the marimba (5:49). As such, the theme covers all the bases of an action game, providing the feel not only of rising into battle and intense combat but also exploring exotic environments (something that was done very well in the orchestral remix from Symphonic Shades). The Turrican II “Title Theme” is an excellent example of how Amiga music was composed. Read the rest of this entry ?